our perfectly imperfect life: We had so much fun! 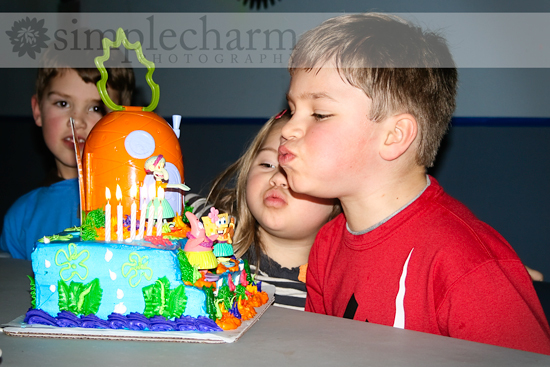 After previously being canceled due to 31 inches of snow, we finally were able to have Mason's 6th birthday party celebration. And wouldn't you know it ... it started snowing again shortly before his party was supposed to start. Snow or no snow ... the party must go on. We rented a limo to take the kids to play laser tag ... to say the kids were excited is a huge understatement. Prior to playing laser tag, everyone has to watch an instructional video. The kids were so cute ... they all were raising their hands asking questions after the video was over. After watching the video, we moved into the vesting area. Depending on the number of people playing at one time, you are split up into teams by vest color. We were lucky to all be on the same team each time ... although our opponents were always older kids. We had so much fun! I guess I didn't know what to expect ... but even us adults had a blast. And the infamous Spongebob cake. 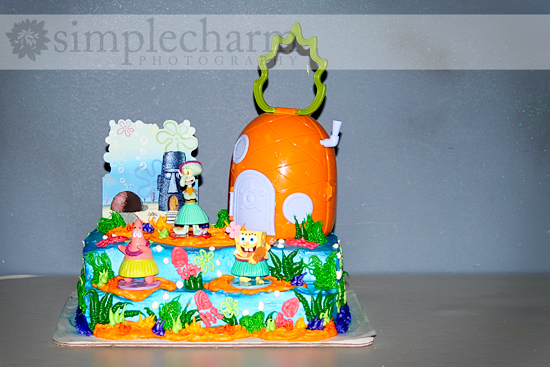 Oh, the Spongebob cake. What is it with my kid's Spongebob obsession? I hate Spongebob and for a long time, Mason was not allowed to watch it. Looks like a blast! and whoa--who made that cake? What a fun birthday and great pics! I love playing laser tag! That is what my son wants this year too! And yes, spongebob...can't stand that cartoon and I didn't let my kids watch it for the longest time, but I caved in this past year...:( what a cute cake! Oh what fun!! The limo was AWESOME!! How does a 6 year old rate to get a limo?? I am almost 40 and have never ridden in one!! LOL!! Hope you have so much fun Mason!! How cool! We had "outlawed" Sponge Bob for years and I thought we were in the clear and then they stayed with grandparents with cable for a weekend and guess what they watched FOR AN ENTIRE DAY...clue:he lives in a pineapple under the sea. Jack had his 7th birthday party at Ultrazone Lazer Tag and they had a blast. I think it is awesome that Payton got to go too! You guys are awesome parents to rent a limo and how cool they upgrade you to a hummer..the kids look so tiny next to it :). How fun. I don't care for Spongebob either. What do kids like about it? I don't get it. Love the limo ride. I bet that was the best part of the party for most of the kids. My boys would LOVE that!!! What a cool mom you are!! 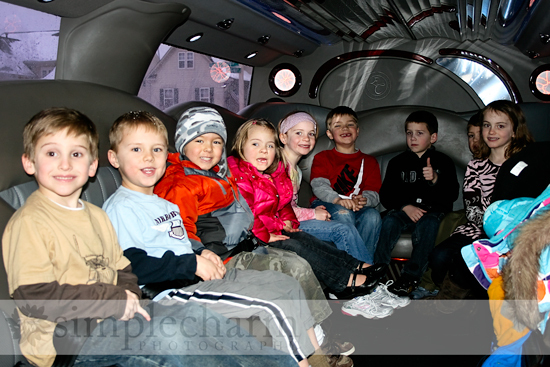 A limo for the 6th birthday...how will you top it. I haven't played lazer tag but my kids have and they LOVED it!! I love that last picture where sister is helping to blow out the candles. Great cake!! Wow! What an amazing party and the limo is the best! 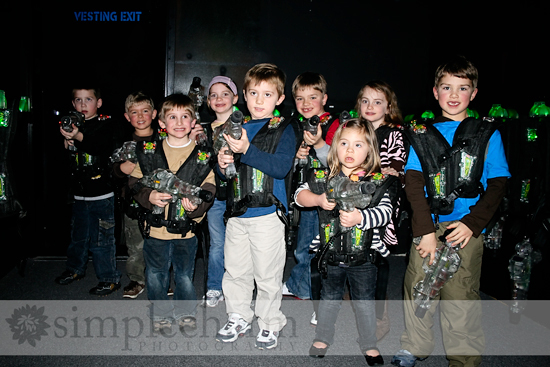 Laser tag sounds like so much fun - I'll have to remember that idea for one of Caleb's future parties! How fun is that! I'm sure they all enjoyed that party! Happy Birthday! Where did you get that cake? It is awesome. The cake is from ... da da dun ... Safeway! Love the limo and the cake especially! Hi Bethany! Your web site looks great...I haven't visited in a while. I remember you saying that after you came home with Nika, you had family pictures done for a discounted fee through some adoption group. Can you give me more info on that? I signed up for the same thing through another web site (can't even remember the name)for families that had kids with SN, but haven't heard anything and it's been like a year...ugh! So now that Ryan is home, maybe I'll go the route you took and we're really due for family pics!! Thanks! 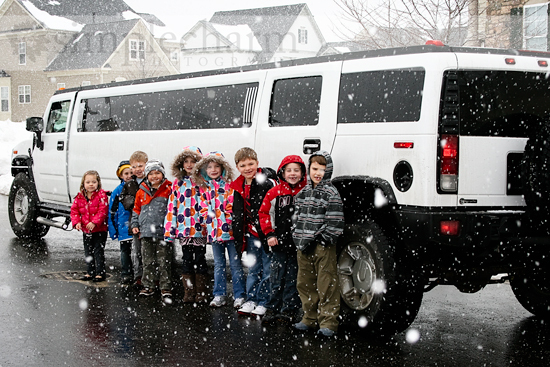 PS We had a canceled birthday party due to the snow too:) But no fancy limos here...looks like fun! It was a blast! Thanks for including us (and letting Brian crash the party..LOL). Man, I look like a pro in the picture you took:) We need to go back for an adult party. The second pic, the one with kids inside the limo; they are very, very excited just by looking at their smiles. Such adorable kids. I can tell that the laser tag was a monumental blast.